Montreal, Quebec – Dlux Studio today is pleased to announce the release and immediate availability of elasticr 2.0 for iPhone, iPad and iPod touch. 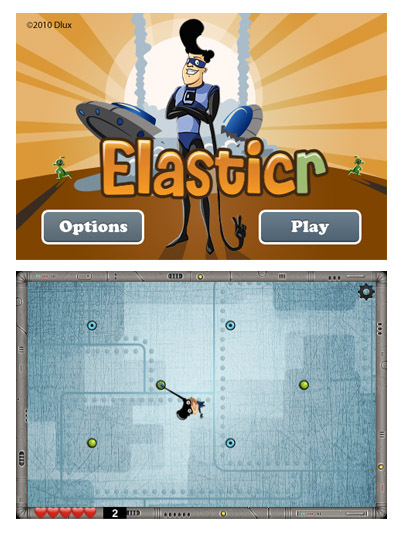 An Alien invasion, a clumsy janitor, a vat of rubber and a burst of radiation lay the groundwork for the latest release of “elasticr, the Stretchiest Superhero” game for the Apple iPhone. The games hero elasticr could very well be the distant cousin of Mr. Fantastic of the Fantastic Four or Helen Parr, aka Elastigirl with his powers of super body elongation, allowing him to fling himself acrobatically around a room to avoid evil aliens, devious traps and sharp spikes as he struggles to save the human race. In the latest version of elasticr, Dlux Studios has added twenty additional levels along with a level chooser, full OpenFeint integration, and significantly more hair gel to manage elasticr’s super sized pompadour. The elasticr app’s physics engine creates realistic flying, bouncing and stretching effects unparallel in the app store. To experience the most fun with rubber since the first rubber band was shot across a room at a co-worker, find the elasticr arcade game in the iTunes app store for only $0.99. elasticr is compatible with all iPhone’s and iPod touch devices running iOS 3.0 or higher. Go ahead and run it on your iPad too… elasticr is more than happy to stretch onto the bigger screen for you. elasticr 2.0 is only $0.99 USD (or equivalent amount in other currencies) and available worldwide exclusively through the App Store in the Games category. Founded in 2004, Dlux Studio is a privately held company with a staff of over 2 people… corporate giants beware! Purveyors of fine iPhone applications, Dlux Studios offers mobile applications with advanced graphic, web, interface and game design with a philosophy of finding the most simple, elegant and convenient solution to any problem without losing the purport. Even their proposals rarely exceed two pages. The Studio’s headquarters is situated in Montreal, Quebec. Copyright (C) 2010 Dlux Studio. All Rights Reserved. Apple, the Apple logo, iPhone, iPod and iPad are registered trademarks of Apple Inc. in the U.S. and/or other countries.